CHICAGO (AP) — Prosecutors still insist Jussie Smollett faked a racist, anti-gay attack on himself in the hopes that the attention would advance his acting career. The "Empire" star still says he was assaulted by two men late at night in downtown Chicago. But with little explanation, authorities on Tuesday abruptly dropped all charges against Smollett, abandoning the criminal case only five weeks after the allegations were filed. In return, prosecutors said, the actor agreed to let the city keep his $10,000 in bail. The dismissal drew a swift backlash from the mayor and police chief and raised questions about why Smollett was not forced to admit what prosecutors had said they could prove in court — that the entire episode was a publicity stunt. Among those sure to keep pressing for answers is Chicago Mayor Rahm Emanuel, who appeared blindsided by the decision. His voice rising in anger at times, Emanuel called the deal "a whitewash of justice" and lashed out at Smollett. He said Smollett had exploited hate-crime laws meant to protect minorities by turning the laws "inside out, upside down for only one thing — himself." "Where is the accountability in the system?" Emanuel asked. "You cannot have, because of a person's position, one set of rules apply to them and another set of rules apply to everybody else." Smollett has become a household name as a result of the case, but it's unclear if the dropped charges will diminish the taint that followed his arrest last month. His insistence that he had been vindicated may make the entertainment industry cautious about fully embracing him. Defense attorneys said Smollett's record was "wiped clean" of the 16 felony counts related to making a false report. The actor, who also agreed to do community service, insisted that he had "been truthful and consistent on every single level since day one." "I would not be my mother's son if I was capable of one drop of what I was being accused of," he told reporters after a court hearing. He thanked the state of Illinois "for attempting to do what's right." In a statement, a spokeswoman for the Cook County prosecutors' office said the dismissal came "after reviewing all of the facts and circumstances of the case." Tandra Simonton called it "a just disposition and appropriate resolution" but said it was not an exoneration. First Assistant State's Attorney Joseph Magats said prosecutors "stand behind the investigation and the facts." When dropping cases, prosecutors will sometimes insist that the defendant accept at least a measure of responsibility. Outside court, neither Smollett nor his legal team appeared to concede anything about his original report in January. Defense attorney Patricia Brown Holmes said Smollett was "attacked by two people he was unable to identify" and "was a victim who was vilified and made to appear as a perpetrator." Authorities alleged that Smollett, who is black and gay, knew the men and arranged for them to pretend to attack him. Emanuel, who leaves office in May after two terms, said the hoax could endanger other gay people who report hate crimes by casting doubt on whether they are telling the truth. Police Superintendent Eddie Johnson said Chicago "is still owed an apology." "I've heard that they wanted their day in court with TV cameras so that America could know the truth. They chose to hide behind secrecy and broker a deal to circumvent the judicial system," he said. Chicago's top prosecutor, Cook County State's Attorney Kim Foxx, recused herself from the investigation before Smollett was charged, citing conversations she had with a Smollett family member. Many legal experts were surprised by the dismissal, especially the fact that it did not include any condition that Smollett apologize and admit he staged the assault. "This situation is totally bizarre. It's highly, highly unusual," said Phil Turner, a Chicago defense attorney and former federal prosecutor with no ties to the case. Smollett reported that he was attacked around 2 a.m. on Jan. 29 on his way home from a sandwich shop. Investigators said he made the false report because he was unhappy with his pay on "Empire" and believed it would promote his career. The actor plays the gay character Jamal Lyon on the hit Fox TV show, which follows a black family as they navigate the ups and downs of the recording industry. Smollett said two masked men shouted racial and anti-gay slurs, poured bleach on him, beat him and looped a rope around his neck. He claimed they shouted, "This is MAGA country" — a reference to President Donald Trump's "Make America Great Again" campaign slogan. He asserted that he could see one of the men was white because he could see the skin around his eyes. Police said Smollett paid $3,500 to the two men, both of whom are black. The men were brothers Abimbola "Abel" and Olabinjo "Ola" Osundairo, and one of them had worked on "Empire." 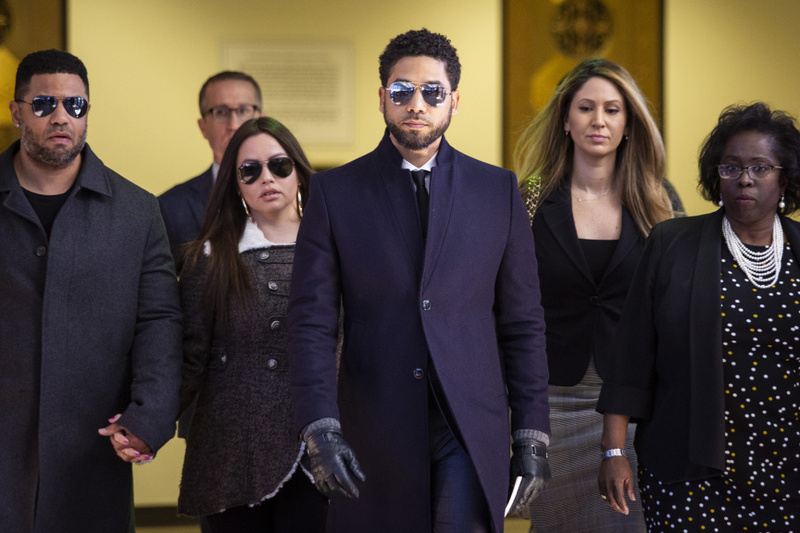 An attorney for them, Gloria Schmidt, has said the brothers agreed to help Smollett because of their friendship with him and the sense that he was helping their careers. They declined to comment. Schmidt said in a statement Tuesday: "The Osundairo brothers were fully prepared to testify in any criminal proceeding in the Jussie Smollett case." Before the attack, police said, Smollett also sent a letter threatening himself to the Chicago studio where "Empire" is shot. The FBI, which is investigating that letter, has declined to comment. Smollett said he wanted "nothing more than to get back to work." But his future with the show was unclear. Shortly after the charges were filed, producers announced that his character would be removed from the final two episodes of the season. Fox Television, which produces "Empire," issued a one-sentence statement late Tuesday saying only that the company was "gratified" that the charges had been dropped.